The Headless Ghost  Three teenagers encounter a ghost who is in limbo until he retrieves his lost head. They do their bit to help him find it. In the style of Hammer Films, this movie a great Friday night cheep click. The original ads for The Headless Ghost read head-hunting teenagers lost in the haunted castle! That pretty much sums things up for this film produced by Herman Choen who also produced Horrors of the Black Museum. The two films were released together as a Drive-In double Feature in 1959, back when double features were the ultimate date. 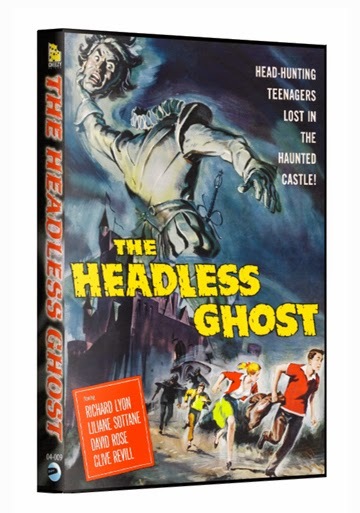 - Cheezy Flicks Entertainment Presents The Headless Ghost Starring: RICHARD LYON, LILIANE SOTTANE, DAVID ROSE, JACK ALLEN, CLIVE REVILL and ALEXANDER ARCHDALE. Written By HERMAN COHEN and ABEN KANDEL, Original Music By GRARD SCHURMANN, Production Design By C. WILFRED ARNOLD, Cinematography By JOHN WILES, Film Editing By BERNARD GRIBBLE, Produced By HERMAN COHEN and Directed By PETER GRAHAM SCOTT If your looking for more info or wish to buy this DVD! Watch the trailer and if you don't agree well then... you don't I am one cool hep cat to be digging this one!